Today it is impossible to imagine a world without electricity. All our activities would almost hamper in the absence of electricity. How were the basics of electricity understood? Where did it all begin? Questions like these might be intriguing for you. The building blocks for manipulating and utilising electricity are voltage, current, and resistance. The energy transfer in electrical circuits cannot be detected without the help of the instruments like ammeter, voltmeter, etc. George Simon Ohm was a German physicist who proposed a relationship between electrical current and potential difference. With this article, we try our best to make the basics, of voltage, current, and resistance and their relationship with other, crystal clear to you. Before we discuss the Ohm’s law in detail, consider setting up an experiment. Take a nichrome wire, an ammeter, a voltmeter, and four cells of 1.5V each and set up a circuit as shown. Initially, use only one cell as a source of energy in the circuit and pen down the readings of current (I), as displayed on the ammeter, and potential difference (V), as displayed on the voltmeter, across XY. XY, here, represents the nichrome wire. Write down these readings in a table. Now, connect two cells in a circuit and again note down the readings for the current and the potential difference. You can now repeat the same process using three and four cells, separately, in the circuit. Therefore, calculate the V to I ratio in each case and plot a graph between V and I. You will observe that the V-I graph will be a straight line which passes through the centre. You will also observe that the value of V/I obtained in each case will, approximately, be the same. Therefore, it can be rightly said that V/I is a constant function. 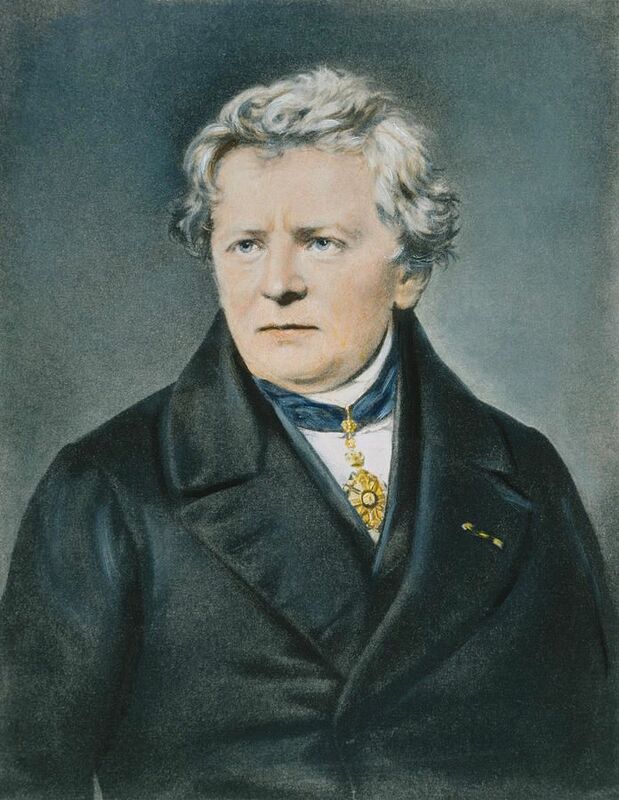 It was in the year 1827 that George Ohm proposed a relationship between current (I), flowing in a metallic wire, and the potential difference (V) across the terminals of the metallic wire. In the above equation, R is a constant, and it is referred to as resistance. For a given metallic wire, R is constant at a given temperature. According to Ohm’s law, R=V/I. Electricity is the flow of electrons. The electrons carry a charge which provides energy. All the light emitting sources like tube lights, flashlights, bulbs, etc. harness the movement of electrons to emit light. The SI unit of electric charge is Coloumb (C). The amount of electrical charge flowing through an area in a unit time is known as electrical current. The electrical current is the rate of flow of electrical charges. When electricity was first observed as a phenomenon, electrons were not known. Hence, the direction of flow of positive charges was taken to be the direction of the electric current. The amount of potential energy between two points in a circuit is defined as voltage. Also known as the potential difference, it is the difference in charge between any two points. It is measured in Volts (V). The potential difference between any two points in an electric circuit is defined as the work done in moving the unit charge from one point to another, V= W/Q; where W= work done and Q=charge. A potential difference of 1 Volt between any two points is defined as 1 Joule of energy which is imparted per Coloumb of charge. Current is defined as the amount of charge flowing through the circuit over a period of time. It is measured in Ampere (A). 1 Ampere is defined as 1 Coloumb charge (6.24 ×10^18 electrons) passing through a point in the circuit in one second. Current is represented by ‘I’ in equations. Resistance is the property of a conductor to resist the flow of electrons. The resistance of a conductor governs the magnitude of the current. The SI unit of the resistance is Ohm (Ω). The resistance of 1 Ohm is defined as the resistance, which when applied a tension of 1 Volt will enable a current of 1 A to flow through the circuit. on the nature of its material. In these equations, ρ or rho is the constant of proportionality. ρ is the electrical resistivity of the material of a conductor. The SI unit of resistivity is Ω m. The resistivity is a property of the material of a conductor. It varies with temperature. The metals and alloys are good conductors of electricity; because they have a low resistivity between the range of 10–8 Ω m to 10–6 Ω m.
Rubber and glass are bad conductors of electricity or insulators. 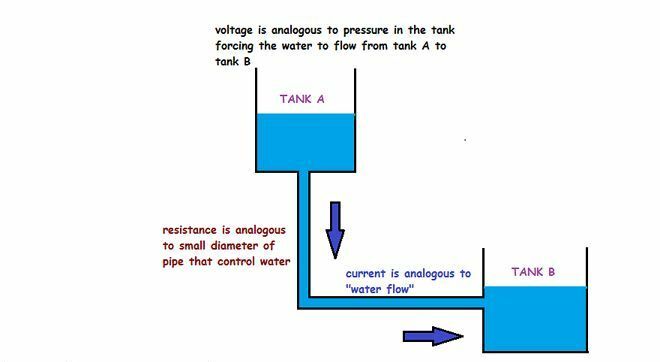 They have a high resistivity between the range of 1012 to 1017 Ω m.
In case you still have difficulty understanding the basics of the electrical charge, current, voltage, and resistance, you can consider a common analogy to a water tank. The amount of water in the tank represents charge, the water pressure represents voltage, and the flow of water represents current. A water tank is at a certain height above the ground; a hose is also present at the base of the tank. Voltage is represented by the pressure at the end of the hose. Since the water inside the tank represents charge, hence, more the amount of water in the tank, high will be the charge, and more will be the pressure at the end of the hose. Now, here, the tank represents a battery. If the tank is drained of a small amount of water, the pressure at the end of the hose falls down. This can be thought of as analogous to the condition whereby a flashlight gets dim as the batteries run out. Now, consider two tanks; each with a hose at their bottoms. Both the tanks have the same amount of water, but the hose of one of the tanks is narrower than the other. If the water begins to flows, the rate of flow will be less for the tank with a narrower hose compared to the tank with a wider hose. Talking in terms of electric circuits, the flow of current through the narrower hose will be less as compared to the flow of current through a wider hose. If we want the same amount of water to flow out from both the tanks, we need to increase the amount of water flowing out from the tank with a narrower hose. As a result, the pressure at the end of the narrower hose needs to be increased to push more water through the tank. This is similar to the increase in current which is caused by the increase in voltage. We are beginning to see a relationship between voltage and current. Now, we will take into consideration the width of the hose. The width of the hose represents the resistance. The flow of water through the narrower hose is less because the narrow hose resists the flow of water regardless of the pressure. This situation will resemble two circuits with the same voltage but different resistance. Less current will flow through a circuit with higher resistance.